Thursday was the fifth off day of the season, and I spent it in and around Denver with my friend Dustin. Dustin and I have been friends since elementary school, and he moved out here a few years ago. I asked if he wanted to join me on this part of the trip, and he was more than willing. We’re leaving in a bit to drive through the night to Phoenix, where the Brewers play next. Then it’s on to Los Angeles, where after the final game I’ll fly back to Milwaukee, and he will drive back to Denver. 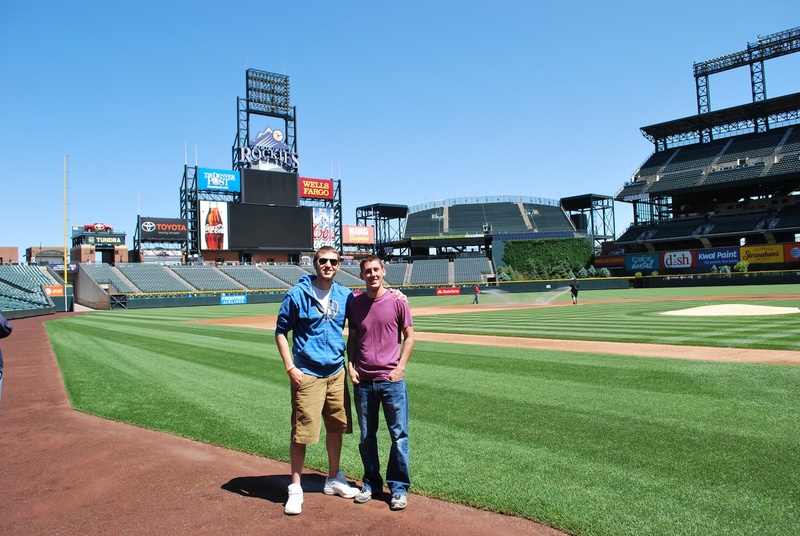 We started Thursday off by going to Coors Field, which is just a mile or so from Dustin’s house. 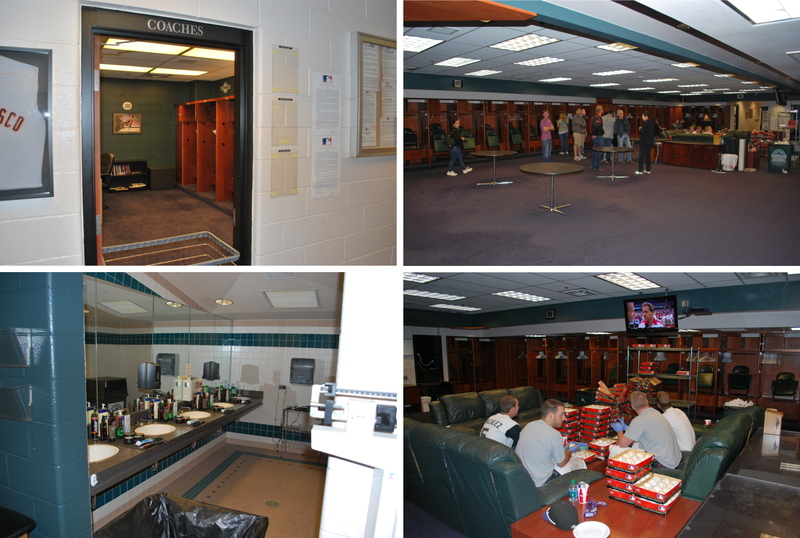 The Rockies also had the day off, so the tour that they offer is more inclusive, and you get to see the visiting clubhouse. We got there about ten minutes late, but luckily all that they had done was go to the upper deck, something that I’ll be doing anyways in August when the Brewers visit. 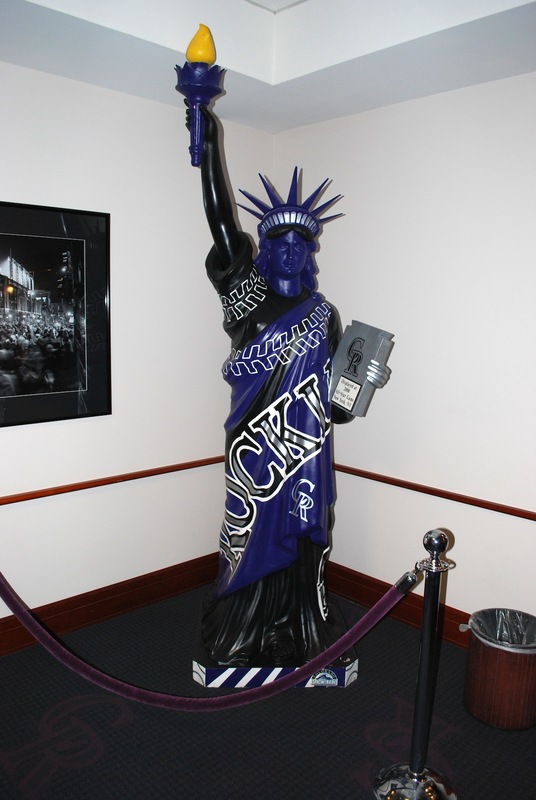 We went to the club level and continued the tour, the first thing we came across is this Statue of Liberty. The Yankees gave each National League team one of these to commemorate the 2008 MLB All-Star game. I’m not sure where the Brewers have theirs, but I don’t think I’ve seen it, or maybe I’ve seen it so many times I just pass by it and don’t pay attention to it. We continued along in the club level, and there was lots to see. There are going to be many four part pictures in this post, and they all go clockwise, starting from the top left. 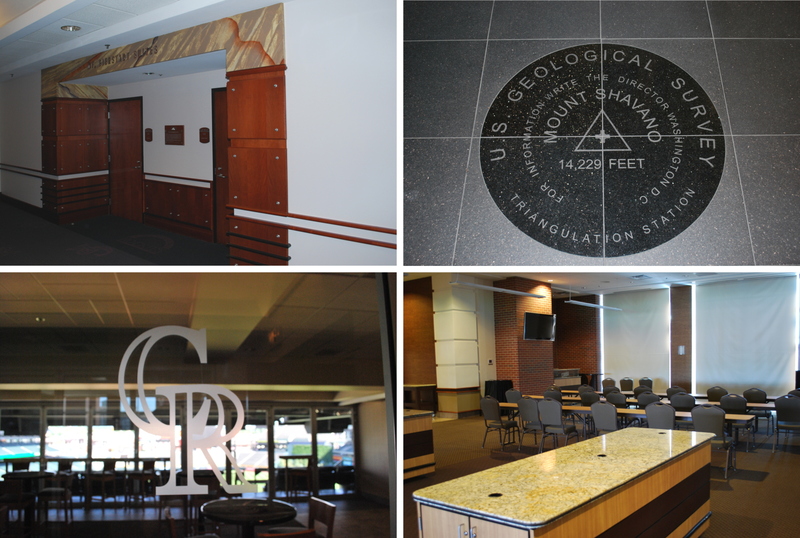 1) The suites are all named after Colorado’s Fourteeners (mountains that are at least 14,000 feet). The ones in this picture are named after Mt. Bierstadt. 2) They had these inscribed in the tiles in the club level, and I thought it was photo-worthy. 3) One of the conference areas. The tour guide told us that after the 2007 season (when the Rockies made the World Series) there were requests for areas for people to hold conferences. They removed nine of the suites and put in a conference room. 4) This is the area across the hall from the conference room, where you can actually see the field. They rent out the conference room individually, so if you wanted to hold a conference/meeting, and go to a game, you would have to book both of them separately. 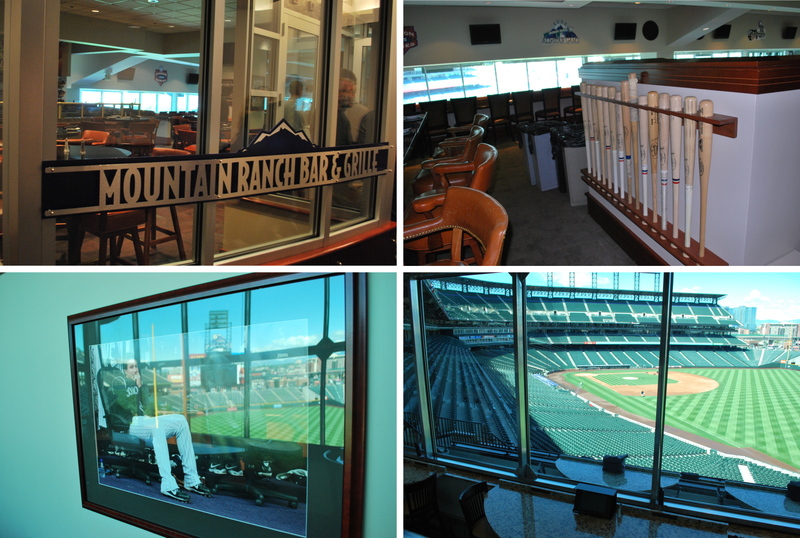 On the Club level there is also a nice restaurant; Mountain Ranch Bar & Grille. 1) The exterior of the restaurant. 3) The view from one of the tables that overlooks the field. 4) A candid (I think) photo of Troy Tulowitski, the Rockies All-Star shortstop. I like the picture because it shows a nice reflection of the field. The press box was the next stop on the tour, and it is quite large. I haven’t been in the press box at Miller Park, but the Rockies press box seems larger. 1) The interior of the press box, I wasn’t even all the way to the right, so there were about 30 more seats behind me. 2) The view of the field, those windows can swing inwards, and there are carabiners on the ceiling to keep them in place. 3) Jorge De La Rosa getting some work in. He’s a former Brewer and is recovering from Tommy John surgery, so he’s rehabbing and trying to get back in June sometime (at least that’s what the tour guide told us). 4) One of the dents in the drywall from a foul ball. Someone in the press box (presumably closest to the dent) writes who hit the ball and the date of the game on the wall itself. After the season they’ll make the repairs, but for the remainder of the season they’ll know who the culprit was. 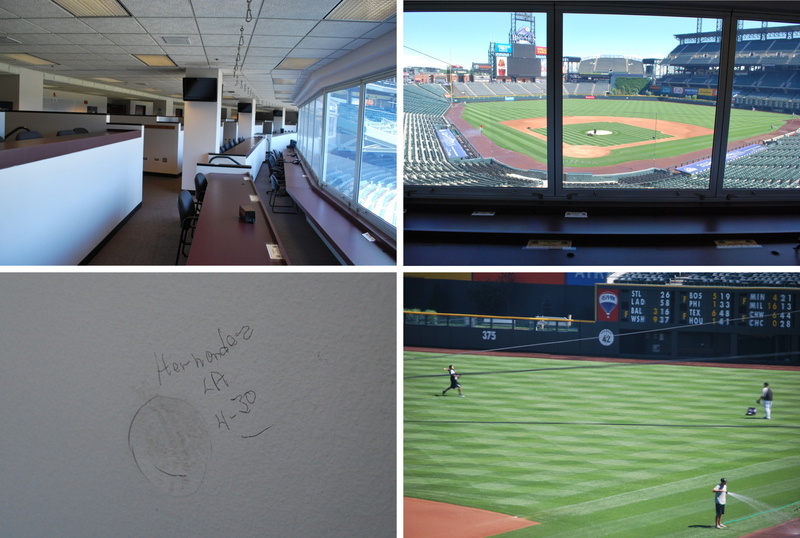 The tour then took us to the depths of Coors field, and we got the tour of the visiting clubhouse. 1) The visiting team’s coaches office. In less than three months, Ron Roenicke is going to be in there planning for the Brewers-Rockies series. 3) Staff rubbing down baseballs for the Rockies’ upcoming home stand. When each team gets their baseballs from Rawlings, they rub them with Lena Blackburne Rubbing Mud. Every team uses the same stuff, and the location of where they get the mud is a secret, but it’s known to be somewhere on the New Jersey side of the Delaware River. 4) Part of the visiting clubhouse’s bathroom. Apparently it doesn’t matter if you forget your shaving cream, because it looks like everything is provided. Out onto the field we went, and I did my best to imitate a manager giving signals to players during a game. We also had the tour guide take a picture of us on the field. 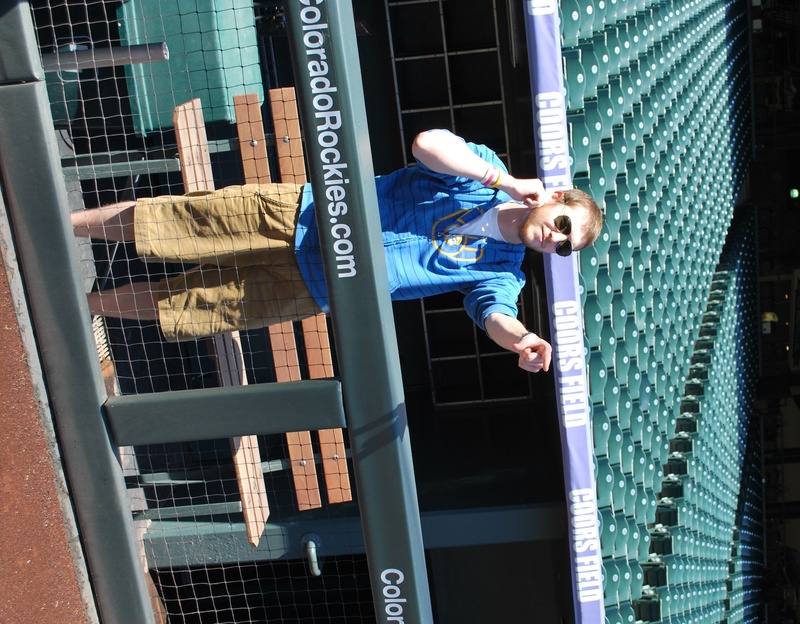 That pretty much concluded the tour, and we left Coors Field and went back to Dustin’s place. We weren’t there long and we headed to Golden Colorado for the Coors Brewers tour. We parked and then found out you take a shuttle bus to the Brewery itself. 1) One of the arches that welcomes you to downtown Golden, you can see one of the shuttles under the G in Golden. We wanted to ride the Coors Light themed bus to the Brewery, but got stuck with the Killian’s Irish Red bus. 2) The exterior of the building where the tour begins. The copper kettle pictured is from the 1880’s. 3) The interior, where you get your wristband for your free samples, and your self guided tour audio device. I’m not a big fan of self-guided tours, but it was alright. You can go at your own pace and skip stuff if you want to, so I guess it makes sense. Dustin and I listened to pretty much everything though. The tour, by the way, is free of charge. 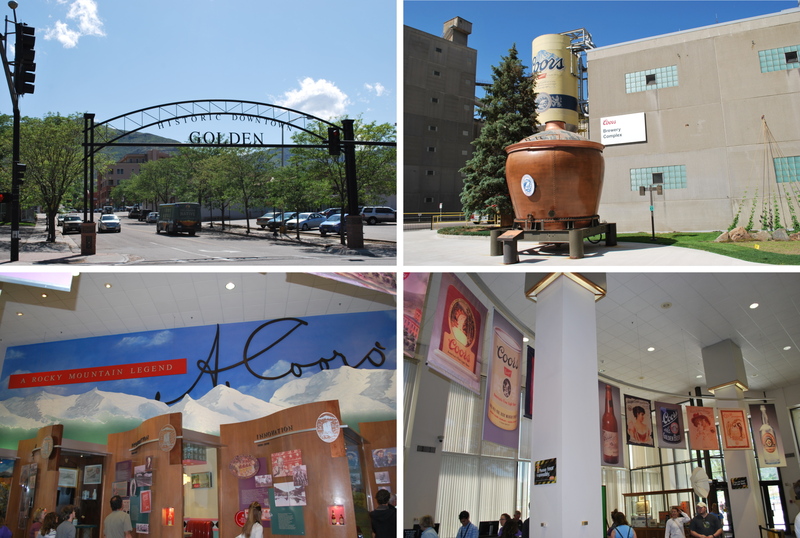 4) The first part of the tour, which explains a little bit about how Coors got started and notable events in its history. 1) A few of the many brew kettles that they have on site. 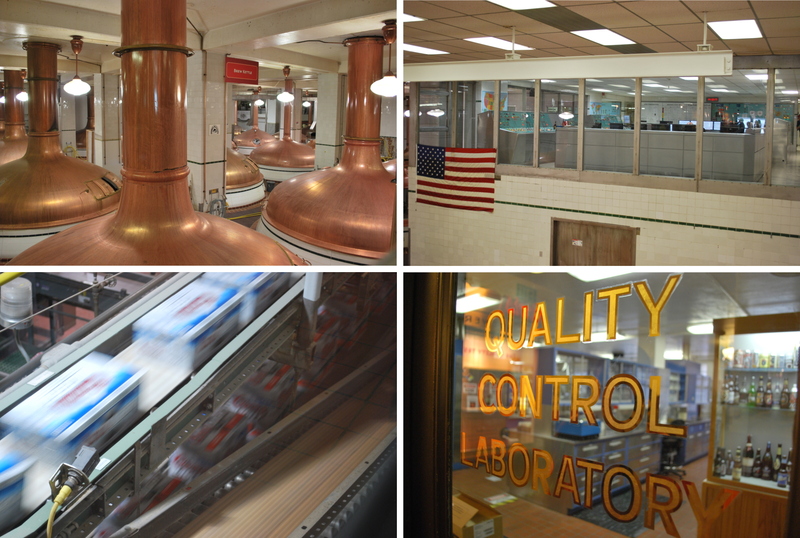 2) The control room, which oversees the brewing process. 3) The quality control laboratory. No one was in there, but our “guide” said there are usually people with white coats in there doing QC. 4) Some cases of Coors Light after they have been packaged. The weren’t going as fast as they look, it’s just that the light was dim enough to require a slow shutter speed. The 30 packs on the bottom were actually for the Bay Area (I assume), because they had a promotion on them for the San Francisco Giants. We only got two of the three samples they offer, hit up the gift shop, and then it was time for lunch. On our way to the shuttle pick-up we had someone get a picture of Dustin and me. You might notice that faint “M” above Dustin’s left shoulder, up towards the peak. If you click the picture you can get a bigger image. The M is for the nearby Colorado School of Mines. 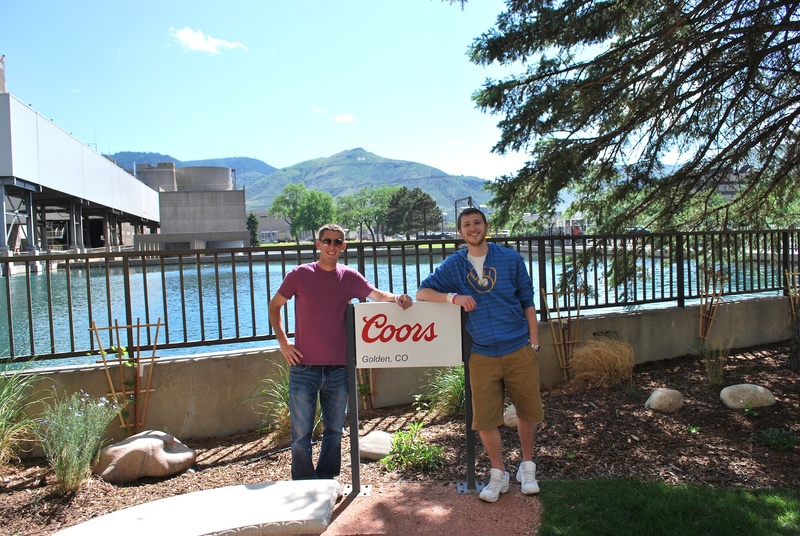 The water behind us is a cooling pond, and it also provides Coors with a little bit of electricity. We had lunch at Old Capital Grill in Golden, and it was delicious. I had the BBQ Pork Stampede, which consisted of tangy strips of pulled pork with grilled onions and Texas toothpicks piled high on a soft bun. I didn’t know what Texas toothpicks were but I learned they are jalapeños and onions that are lightly breaded and then deep fried. I thought it would be spicier than it was, but it was still worth the $8.95. The sandwiches come with french fries and, get this, a small red delicious apple. We were both a little confused when our waiter brought us our meal. I like the idea though, and was not disappointed by finishing off a meal with a crisp apple. We’re leaving shortly, and should be arriving in Phoenix between 11:00 am and noon. After a nap at the hotel, it’ll be off to Chase Field for game number 45 of the season.